This delicious healthy side dish looks like a colorful bowl of confetti. 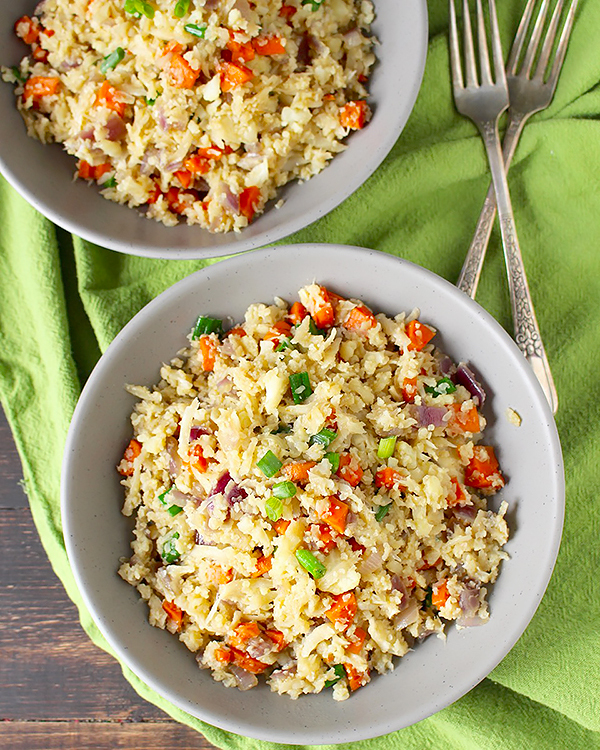 With the substitution of riced cauliflower for the rice and chopped tomatoes for the sugary carrots, this is a perfect dish to accompany any meal. Plus you can add any number of vegetables to suit your taste, including red, green, and yellow peppers, and zucchini and yellow squash. If you want to turn the dish into a complete meal, toss in chopped or shredded chicken, steak, or shrimp. The origin of fried rice comes from the Far East with the ancient Asian tradition of not throwing away leftover rice and other foods, making the dish an economical hodge-podge. It is also a popular street food in many Southeast Asian countries using a wok or a frying pan. Our recipe follows the same tradition, but we’ve tinkered with the ingredients to make them more palatable for those with sucrose intolerance. In large pan, cook the diced onion in the coconut oil until soft; season with salt, ginger, and garlic while cooking. Once onion is tender, add the cauliflower and soy sauce. Add chopped tomatoes and cook for about 1 minute. Push the mixture to one side of the pan and add the eggs. Stir until cooked, then mix in. Add the green onion, take off the heat and serve.